US, 1998, 117 minutes, Colour. Jeff Bridges, Tim Robbins, Joan Cusack, Hope Davis?. 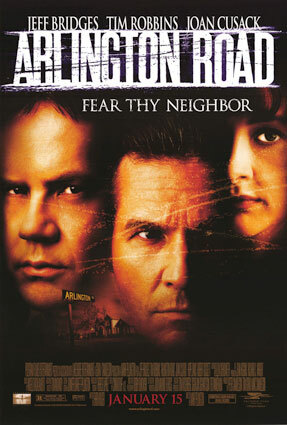 Arlington Road is a very well-made conspiracy thriller. It reflects some of the paranoia inherent in the United States with its suspicions of communists, right-wing groups, attacks from outside. The film stars Jeff Bridges as a professor, expert in conspiracy theory, who, unbeknownst to himself, is victimised by his smiling neighbour, a right-wing fanatic. Tim Robbins plays the fanatic with an oily charm. He and his wife (Joan Cusack) seem your typical respectable next-door neighbours until they gradually manifest their ideologies and motivations. The film reflects the changing attitudes of the United States over the forty years since the death of John F. Kennedy - although, with the House of UnAmerican? Activities and the Senator McCarthy? interrogations, there have been many precedents for the right-wing, left-wing split in America. The film explores themes of truth and lies, Jeff Bridges appearing as an everyman victim, even to the pessimistic ending. The film was directed by Mark Pelington, who went on to make another X-Files? paranoia conspiracy thriller, The Mothman Prophecies with Richard Gere. 1. American conspiracy theories? American paranoia? The increasing terrorists and their causes in the '90s? American terrorists against government abuse? 2. The Washington settings, wide screen, the musical score? 3. The art effects of the credits? Setting a mood? The pacing and the editing for the chases, sense of menace and paranoia? 4. The title, ordinariness - but where the conspirators are as our neighbours? 5. The introduction, Brady walking in the middle of the street, his burns, the blurred vision? Michael stopping, getting frantic, shouting, taking him to the hospital? Meeting Oliver and Cheryl? Discovering his neighbours and not having met them before? 6. Michael visiting Brady, the bonds with the Langs, the visits to the various homes, sharing, telling stories? The boys and their playing - and Brady taking control, militaristic, secrecy from Michael? Oliver coaching Grant at baseball, Grant confiding in him rather than in his father? The scout troop and the ceremony? Michael and his changing his mind about Grant going to camp, Grant's tantrum and reaction, accusing his father of lies? His finally relenting? 7. The relationship between Michael and Brooke? Her being his assistant, knowing both Michael and Leah? Grant and his wariness? His not wanting to lose his mother's place in the family? Michael and his suspicions, the blueprints for the building, Oliver's lies, talking with Brooke? Michael and his phoning to find out the information? Looking up the Kansas papers - and being caught by Oliver? Going into his house, the daughter's reluctance, the phone and the mobile phone, Cheryl's arrival back? Brooke and her trying to persuade him that he was paranoid - leaving him? 8. Michael's story, his relationship with his wife, the flashbacks to the raid, the mistakes made by the FBI, the violence of the family, the irony that the information was wrong? Leah's death? Michael obsessed and grieving? His blaming the government? His discussions with Witt? His lectures, American history, the history of conspiracies, his slides, the explanations of the St Louis? bombing? The field trips, going to the scene where his wife was killed? The pressure on his students? All this backfiring on him and making it easier to blame him for the final catastrophe? 9. Brooke, her love for Michael, her working for him, supporting the family? Enjoying his company, the meal with Oliver and Cheryl, the political discussion, her more benign interpretation? Seeing Oliver and his changing the case, following him, seeing the vans, phoning - and the message being obliterated, the pathos of her death? 10. Michael and his growing desperation, suspicions of Oliver, grief for Brooke? Grant gone to the camp, phoning him? His going to get him and Oliver having taken him already? The party with all the Liberty vans outside? 11. Oliver and his coming to Michael, the plausible explanation, the 16-year-old, the family difficulties, finding his dead father, his making the bomb, its not going off? The reasons for his life, demanding an apology, being neighbourly? 12. Michael going to St Louis?, the father of the victim, the photos, seeing the evidence for Oliver? The irony that this would be the pattern for Michael himself? 13. Ringing Witt, Oliver having a hold over him with taking Grant? His silence? 14. The build-up to the chase, the Liberty van, his being blocked by Oliver, their fight, Oliver's ideological explanation? Michael getting desperate, entering the FBI precincts, more and more frantic and shouting, Witt? The irony of realising the bomb was in his car and that he had been manipulated? Oliver watching the explosion? 15. The attack on the FBI, the destruction and deaths? The media reports, the information about Michael, all the evidence indicating that he was to blame, the bomb in his car, his lectures, the students? Grant being looked after by the Langs? 16. An entertaining film of American paranoia, terrorists, the FBI? A critique of American paranoia?